← Google Glass is the Top Tech Trend! IEEE Spectrum: What is Google trying to accomplish with Google Glass? Babak Parviz: We wanted to have a device that would do two things that we think would be useful for a lot of people. One is to have a device that would allow for pictorial communications, to allow people to connect to others with images and video. Right now, we don’t have any devices that are specifically engineered to connect to others using images or video. So we wanted to have a device that would see the world through your eyes and allow you to share that view with other people. The second big goal was to have a technology that would allow people to access information very, very quickly. So when you have a question, you can very rapidly get to the answer. IEEE Spectrum: How will people interact with Google Glass? Babak Parviz: Right now, we have a touch pad on the device that allows people to change things on the device if they wish to do so. We have also experimented a lot with using voice commands. We have full audio in and audio out, which is a nice, natural way of interacting with something that you’d wear and always have with you. We have also experimented with some head gestures. Details about Glass are still sketchy but here’s what we know. The lightweight browband, which looks like an ordinary pair of reading glasses minus the lenses, connects to an earpiece that has much the same electronics you’d find in an Android phone: a micro processor, a memory chip, a battery, a speaker, two microphones, a video camera, a Wi-Fi antenna, Bluetooth, an accelerometer, a gyroscope, and a compass. The microdisplay is positioned over one eye. 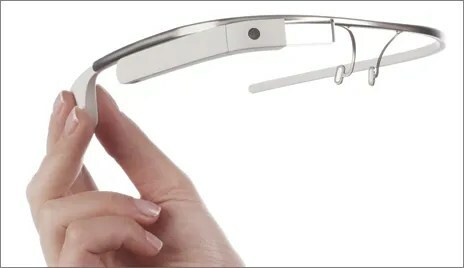 That hardware lets Glass record its wearer’s conversations and surroundings and store those recordings in the cloud; respond to voice commands, finger taps, and swipes on an earpiece that doubles as a touch pad; and automatically take pictures every 10 seconds. Prototypes connect to the Internet through Wi-Fi or through Bluetooth and a smartphone. Future versions will likely include a cellular antenna. Start-ups Atheer, First Person Vision, Lumus, and Vergence Labs all have Glass-like prototypes in the works.